Continuing with Christmas today on the JustRite Mega Font Blog Hop … I promised my mom a few weeks ago that I would make a few things for her to contribute to the annual craft bazaar that is coming up. I thought these little list pads would be cute for her to take. 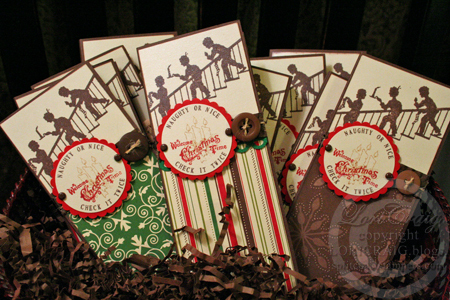 Last year, I realized that I liked mixing my JustRite fonts (on sale thru 9/24) with fun stamp images and sentiments for one of a kind tags on Christmas gifts and packaging. I loved this stamp image of these little children sneaking down the stairs with their candles, stockings in tow (CHF). 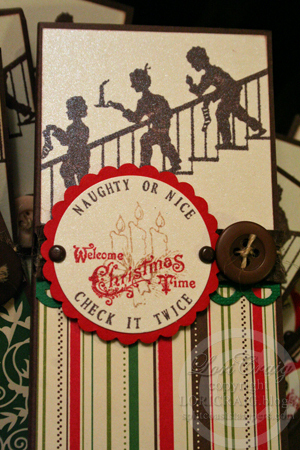 I started with Poison Ivory cardstock, and using my JustRite 1 5/8″ round stamper and the Small Letter Set, I created a custom sentiment, ‘naughty or nice…check it twice‘, stamped in dark brown around the outside of my circle. Then I filled in the center with the candle image from Merry Little Christmas in lighter, latte colored ink. Over the top of that, I stamped Welcome Christmas Time (CHF) in Real Red ink. 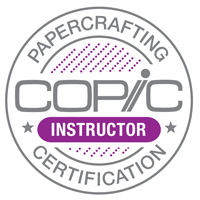 The ivory circle is punched with a 1 3/4″ circle punch and layered on the Marvy scalloped circle punch (super jumbo). These list pads are made from 5″x8″ inch legal pads that I had cut in half at the local office supply. You can view the full tutorial on how to cover your own at Splitcoast. 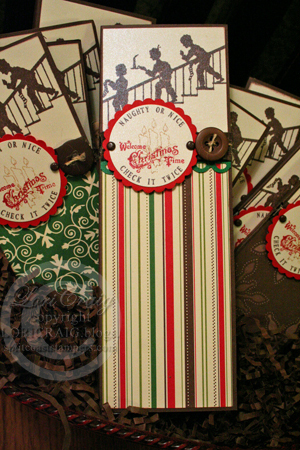 The patterned paper is from the Merry Moments pack at Stampin’ Up! I’m glad to have this project checked off of my Christmas list, but I think I’ll be making a few more lists in the next few days. They are too easy. This entry was posted in Cornish Heritage Farms, JustRite. Bookmark the permalink. Wonderful idea nd I love the vintage look! The tags make a perfect embellishment for the lists. Love the colors. Very cute, love the antique look this has. Wonderful projects! I love the paper you used, too. Love these cards and the mixed fonts. Your card is so cute. Makes me wish my children were small again and would come down the stairs to see if santa had come. So CUTE, I love that image of the kids going downstairs….awesome notepads!! Very clever! Love your idea. Wonderful card – love your colors! The list pads are a neat idea. I like the vintage colors and the children on the stairs image. The saying seems very fitting. Darling project, Lori — love the shimmer cardstock (of course!) and the sweet children image with candle image repeated … beautiful! Love it! Glad to visit your site, hadn’t been here before! These are so cute! I love the stamp of the children sneaking down the stairs. This info is the cat’s paajams! These are so darling! Love the image of the kids on the stairs….and of course you JR sentiments are PERFECT! Love them!!! Very creative! Love the look of these! It doesn’t get any cuter than this. I love how the kids are sneaking down the steps. Everything is perfect. Thanks for the great project. What a great idea! Love it. these are priceless. Thank you so much for the inspiration. Love these kids sneaking down the stairs. Your card is great. Love how you are able to mass produce the list pads, but still get some different looks by using different papers. Very cute! Don’t ya love Just Right? What a great sentiment for a list pad! Great projects…your Mum will be thrilled. Very nice. Great job. Your blog certainly has me thinking about Christmas! I WILL HAVE TO MAKE THESE FOR MY 5 GRANDCHILDREN,,,THANKS FOR SHARING YOUR IDEAS!!! What a great idea! PS Your other work is beautuful too! How cute are those kiddies! Oh !!! This is so darling, Thanks so much for sharing your lovely work. OMG!!!!! Lori, these are totally adorable!!! So, so cute! Reminds me of “Twas the Night Before Christmas”…one of my faves! www dot roomvues dot com (crazy y!a won’t let me post the aactul link.You can upload a photo of your house to the makeover gallery and ask them to photoshop it with whatever colors you’re considering. I absolutely love the list card. You did a great job on the project. thanks so much for sharing…. Fantastic job with the notepad covers! Loved the kids sneaking down the stairs, along with your cute sentiment. I really like the way you mixed stamps. Super project. Very nice cards. Thank you for sharing. If my problem was a Death Star, this article is a photon todorep. Great project! Thanks for the ideas. Perfect notepads…LOVE the tag with the image you chose! Take good care, Lori! These are just charming Lori!! I LOVE those silhouettes and the dp you paired them with!! Your sentiment will be sure to bring smiles from everyone. Great idea for bazaar or small token gifts. I love this idea. That image is great. Fun ‘stair’ image. tfs and participating in this fun JRS hop. These are adorable Lori – love it. Great project for the holidays. Thanks for sharing! These notepads are so beautiful!! I love the whole color scheme! Cute,and an inspiration, because I have to get in gear for Christmas! These are great. Everybody needs a list. Even if they can’t find them after they make them. Like me. Cute idea! I need to start that Christmas list, the sooner the better. I’m always behind on that! Thanks for sharing. Love the idea and very cute. Can’t wait to give it a try. I have seen these note pad projects around but yet to try them. This is a great idea for bazaar thanks for sharing. What a great idea for those much needed extra little gifts…I love the shadow effect of the children and then the Just Rite Stamps it doesn’t get any better…Very well done! I love your project and I especially “need” to own that darling stamp with the kids coming down the stairs. Thanks for sharing. This is a wonderful card! Thanks for your hard work! Very cute project. I like the way you mixed your images. It gives me some ideas and inspiration. Thank you and God bless! Cute! Reminds me of Christmas when I was quite a bit younger! Love them! Great vintage card. Love the silhouettes. The Christmas lettering it perfect. Love the silhouettes! Great project! What a great idea for Christmas gifts. I’m always looking for just the right saying when I’m doing my stamping, but usually have to settle for what stamp I have instead of what sayings I could put on my project if I had these sets. You guys are really enabling us to buy more stamps, but at least with these sets they’ll get TONS of use! Wow love the image and the over stamping. Great job. Love your list pads! TFS! Great job i like.Greetings from Finland. Great projects! Thanks for sharing. awesome pads!! thanks for pointing us to the tut!!! I love JustRite’s Blog hops! I can’t wait to see all of the participant’s blogs.☺ I love your project. How cute! LOVE the images and the colors and what a great use of the letters. Love these list pads. Great idea for small gifts. Thanks for sharing the idea. Love this idea, everyone always needs a note pad, great gift idea! This is just adorable. I like how you overstamped too. cute sneaking kids! How creative! Great project. Great tour! These cards are absolutely, positively the sweetest ever! Love the notepads. I’m sue your mom will love them. Lori, this is SO cute. I love the kids going down the stairs too! I hadn’t seen that stamp before. I’m sure your item will go quickly in the Craft Bazzar. I’d buy one! Thanks for sharing! These are really cute. Love the cards. Cute idea. I love the stamped image of the kids sneaking downstairs! very, very cute, love it. Too Cute!! Thanks for sharing!! I love what you did with this darling image!!!!! Adorable. I love, love, love your idea. Can’t wait to get some of those legal pads. These would be great gifts for our neighbors! Thanks for sharing this wonderful gift idea. Reading this makes my deicnioss easier than taking candy from a baby. Oh my Lord! So sweet!! I love these notepads and the kids sneaking down the stairs. Love the list pads, what a great idea! Lov’in the projects on this hop..tons of inspiration I want to play! yours are so pretty – i made these for my bridge group last christmas and everyone loved them! WOWOOW Lori!!! I love your project (and love the way you took pics of it!!!) simply beautiful! These list pads are so beautiful. Wouln’t they make a great teacher’s gift. Your Mom is lucky to have you make things for her bazaar. I love these! What a great idea … soooo cute! These are just beautiful.I just love the stamp image. What a great gift idea. What a creative and adorable project!I like how you combined the different stamps and fonts together. This reminds me of my childhood and sneaking down the steps to see what Santa brought me. These are amazing as is all your creations!!! These are wonderful! The CHF stamp is perfect and love the papers you chose. You always bring such a youthful creativity to your projects. I love seeing through your eyes!! There is a lot more work in these wonderful projects than the recipient will realize but I can imagine you sitting there having fun the whole time you were working on them! 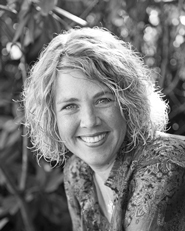 Thank you Lori – you have sent me down memory lane. Your card so reminds me of Christmas mornings from long ago. What a great project love your idea! Very unique and very cute! I love the note pads. They’re wonderful. What a great idea. Everything about them are great. Thanks for sharing your creativity. These are so adorable Lori, perfect for the craft bizarre! I love the “Welcome Christmas Time” stamp! And, love how you stamped it over the candles. Totally adorable design! Thanks for sharing your beautiful creation! I love these list pads. What a great project. I’d really like to try these sometime. Very nice cards. You used beautiful DP. This is such a clever idea. You are sweet to help your mom! Your list pads are too cute! Thanks for sharing them. Love the children walking down the stairs! Great card! That is the cutest stamp! It so reminds me of my children on Christmas Eve. I love silhouette stamps but never seemed to create any spark in the finished project. You have given my inspiration to get out of my box. Thanks. Just loved everything about this project. Great idea and beautifully done! I love this! Thanks so much for sharing!! Very nice and a great sale at just rite also. The silhouette image coming down the stairs are so cute. Great list pads, and something we all can use! Loved your idea for the stamp pad. And I really liked the look quite amazing those stamps. I’ll want to come back and learn more. Great project. Love the different stamps that you used. I like the shimmer of your card…Is it the paper or added touch? Fabulous cards! Love the shimmer. Lori, what a GREAT idea! Love it! Great idea on how to use the fonts. Love the way you have used the stamps and love the sentiments! Cute project. Love the vintage look of it. TFS! This vintage style Chrsitmas card works so well -it’s a bit different which I like. I also really like the wording of the sentiment. Overall a lovely individual card! I love everything about this card. Charming. Great project, thanks for sharing. These are sooo adorable, love it! Too cute! Thanks for sharing! Oh how cute is this project. Love that silhouette image on the stairs. I wonder when my Just Right products will arrive so I case so of these projects. Lori, This is just too darn cute! I’ve had so much fun looking at all of these wonderful projects! TFS! Great project, thanks for sharing! Fabulous! Love the long shape, the lay-out, the cute image with the kids… TFS! Cute cards. Love the colors and they are fun! This may be my favorite project of the whole JR hop…such a great idea! Love the idea! And the image is adorable! Your list pads are absolutely FABULOUS, Lori!! I LOVE them!! What a great idea – love these!! I think this card is adorable. I love the children. I also love the Naughty or Nice with the JustRite stamp. Love these little list pads Lori! The children on the staircase is such a cute stamp and I like how you did the double stamping too. Really nicely done! Thanks for sharing your ideas! What terrific ideas! I love the. Thanks for sharing! These are just TOO CUTE! Thanks for the inspiration! I love this idea, the Christmas lettering is on MY list!!! tfs. Just wonderful notepads. Great idea for gifts and such. Thank you for sharing. Phyllis M.
Love this! Great combination of stamps, paper, everything. Thanks for the inspiration! SO cute! Great idea to dress up a notepad! What a great image … and I love the saying you created for a planner list! Great project … Thanks! I love this project. I would love to see a card created with the same stamps. Thanks so much for sharing. Great idea!! Thanks for sharing!! What a wonderful project. Absolutely adorable. Thanks for the inspiration. I love the vintage feel of your project – terrific! This is really cute. Love those stamps! Wowzas Lori – these are seriously DARLING! 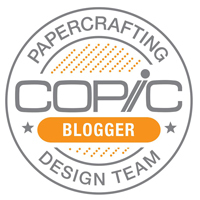 New to your weblog. Came across it surfing the internet. Carry on the good work. I really hope you update it often. I want to start my own website. Are there any places I can do this for free with minimum advertising on them? Or all free places have heaps of advertising?. I’m Michael orlin Sigler and am really inspired with your writing abilities as neatly as with the layout on your weblog. Is that this a paid theme or did you customize it your self? Either way keep up the excellent high quality writing, it’s uncommon to see a nice blog like this one these days. I’m Michael orlin Sigler and am really inspired with your writing talents as well as with the layout on your blog. Is this a paid topic or did you modify it yourself? Anyway stay up the excellent high quality writing, it’s rare to look a nice blog like this one these days. Good day very nice blog!! Guy .. Excellent .. Superb ..
out numerous useful info here within the submit, we’d like work out extra techniques on this regard, thank you ffor sharing.